Add functionality and flair to your backyard, patio or balcony with this lovely five-piece patio set from International Caravan Home Furnishings. The set of two chairs and a table are fashioned from Balau hardwood, a sustainable material that ensures years of beauty, durability and reliable use. Finished in a water-resistant, dark honey stain, this set adds style and comfort to your outdoor spaces. With two bistro chairs and one bistro table, this elegant set is functional in a traditionally stylish way and enhances any deck, balcony or garden space. This set provides reliable beauty and functionality to enjoy for many seasons. These finely crafted pieces are made to last thanks to their sturdy construction, weather-resistant finish and timeless look. My husband and I ordered this item to use while we sat on our back patio to drink coffee in the morning. The chairs are rather sturdy and comfortable.The main reason why I gave this a rating of 4/5 is because the base of the table is not as stable as I would like and it wobbles a bit. Otherwise, this is a nice addition to our patio. 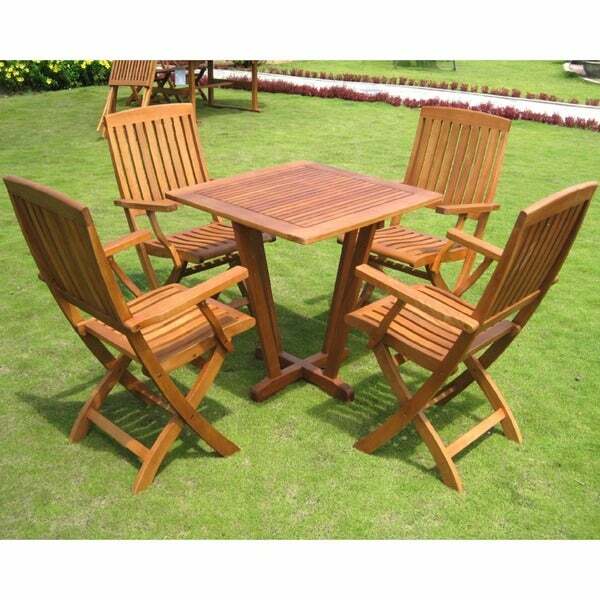 This is an excellent patio set - well worth it for a reasonable price. It was very easy to assemble and looks fantastic. I am really pleased with my purchase. Very pleased with the set. Came well packed and very easy to assemble. Chairs needed to be tightened before use. Very pleased with purchase. Fast shipping. "What is max weight capacity for the chairs?" "What is hardware made of?" The hardware is made of Galvanized steel. "what is the seat height"
The seat height is approximately 18" inches. "What are the chair dimensions? Do they fold?" Hello Kimberly J., the chairs are approximately 24.5 inches wide x 21.5 inches deep x 36.5 inches high. The chairs are fold-able. Thank you for shopping with us. "What size cushion would fit on this chair?" A cushion that measures 28 inches or less would fit the chair.